M. D. Benoit is announcing the publication of her first Urban Fantasy Novel, out on 3 November 2014. Is one woman enough against such powerful, timeless sorcery? Pragmatic, cynical Jane Brockwell never gave magic a thought, so it comes as a shock when she awakes one day with magical powers and the ability to see the future through terrifying visions. Almost immediately, Jane becomes embroiled in competing Guilds of witches and warlocks who want to recruit her. But it is soon obvious that her magic is different and immeasurably powerful, perhaps as potent as that of Demos the Great, the most revered and reviled sorcerer of all time, who lived in 300AD. 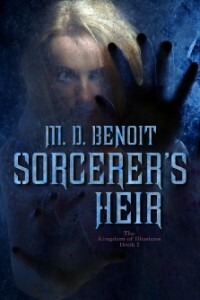 Is Jane the descendant and heir of Demos, and a sorceress herself? Garrick Ramsay, an ambitious, ruthless and powerful warlock believes so and sees her as a threat to his ambitions. He attacks her, nearly killing her and Hugh MacLean, her boss and love interest. Ramsay is relentless in his pursuit of them; a dark, hovering presence surrounds him and, with each encounter, he seems to gain strength. Jane and Hugh begin to wonder if there may not be a more sinister force guiding Ramsay’s actions. Where did Ramsay get the Book of Secrets, a grimoire of spells from the Dark Arts? And how important is the Void, a place between worlds Jane can use to travel? Could it be the key that unlocks the mystery of the dark presence that seems to support Ramsay?